As part its Capital Vision 2020, the Diocese of London is committed to equip and commission 100,000 ambassadors representing Jesus Christ in daily life. We read in 2 Corinthians 5.20: “We are therefore Christ’s ambassadors as though God were making his appeal through us”. An ambassador of Jesus Christ is any person who is a follower of Jesus Christ and is thus sent out to live and work to His praise and glory in daily life. This is about people living out their Christian discipleship among all the people and places of their week. At Holy Trinity Southall we have embraced this vision. We are one the pilot churches seeking to find new ways to encourage and equip our members to be effective ambassadors for Christ amongst the people where they spend most of their time each week wherever that may be: at work, in family life or in the community. During some of our Sunday morning services church members speak about what they will be doing "This Time Tomorrow". They tell us a little about their work or other main activity, highlight the opportunities and challenges in their situation, and let us know what they would like us to pray for them: then we do that. In this way we get to know one another better and can continue to pray for one another in a more meaningful way. 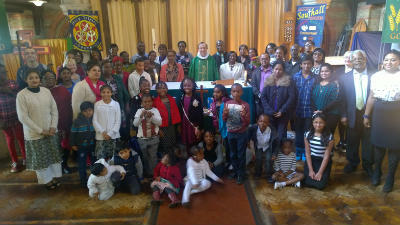 Holy Trinity Southall commissioned church members of all ages as Ambassadors for Jesus Christ in Daily Life during the Harvest Thanksgiving Eucharist on Sunday 5 October 2014. The theme of the harvest service this year was, “The Fruits of All Our Labours”. As well as giving thanks for God’s provision for our needs, we remembered the contribution that all of us, along with countless people near and far, make to our well-being. We thought about the ways that church members spend their time during the week: some in various kinds of paid work; others focussed on family life, caring for children, grandchildren or elderly relatives; at school, college or university; or doing voluntary work in the local community. We had the latest in a regular series of “This Time Tomorrow” slots in our Sunday services in which church members speak briefly about how they spend their time day by day and the challenges and opportunities they face in living out their Christian faith in their daily lives. At the harvest service we heard from a secondary school pupil and someone coming towards the end of working life. In March 2014 a small team led by the Vicar, the Rev’d Michael Bolley, attended an Ambassadors workshop at St Mellitus’ College and came back eager for us to give much more attention in church life to equipping and supporting church members to be, in the words of St Paul, “ambassadors for Christ” among the people they spend their time with day by day. The team organised a special service on this theme shortly after Easter, and it was apparent from the response of the congregation that we had touched a nerve and there was a real thirst for more of this! We are now one of nine parishes across the Diocese of London working together to pilot the Ambassadors strand of Capital Vision 2020. Having made “This Time Tomorrow” a key part of our church life and held a second special service in July, we decided that the time had come for us to do a formal act of Commissioning during our Sunday worship. It was important to us that the invitation to be recognised and commissioned as an Ambassador should be for everyone, not limited by age (too young or too old) or by too much focus on paid work, whilst at the same time wanting to ensure that people were making a conscious choice to participate, not just being commissioned almost by accident because they happened to be there. For this reason we asked people to fill in simple sign-up cards which were collected and presented at the altar (with a copy for them to keep). Church members had been asked in advance to bring with them an object which represented their work or the way they spent their time day by day, and following an act of commitment people brought these forward and placed them at the foot of the cross on a table in front of the altar. The Vicar then commissioned people as Ambassadors for Christ in daily life, and each person was anointed with the oil of chrism to empower them for ministry. The next step was to run the “Life on the Frontline” course from LICC to equip our new ambassadors further.